Extreme Max BoatTector products are designed to provide optimal protection for boats and watercraft. Every item we offer has been carefully selected for its durability and performance in harsh marine conditions. 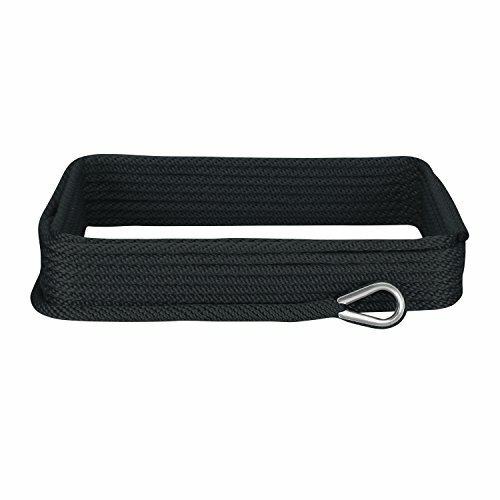 This premium anchor line is lightweight and floatable, with a tough solid braid construction, and a stainless steel thimble for simple, secure anchor attachment. MFP (Multifilament Polypropylene) anchor line is stronger and softer than traditional polypropylene. It’s more economical than nylon or polyester, with the soft hand feel of nylon at a lower price point. It’s lighter weight than its nylon and polyester counterparts, and will float when thrown in water. MFP holds knots well, and has high abrasion resistance. It also resists chemicals, rot, and mildew. This solid braid anchor line is round, flexible and smooth. Unlike twisted or diamond braid ropes, it won’t unravel when cut with knife or scissors. Solid braid is also less likely to kink or hockle. All Extreme Max BoatTector line and cordage products are designed for optimal utility and durability, and carry a limited lifetime warranty. * Working Load Limits shown are guidelines. This product is intended for non-critical consumer applications. Not to be used for overhead lifting, or in applications with a risk of death, personal injury or property damage. *Working load limit: 250 lbs. / Breaking strength: 1290 lbs.